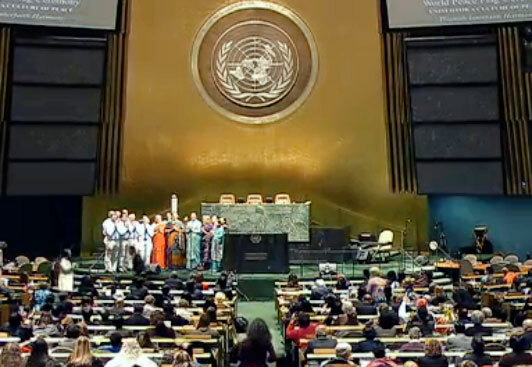 A choir of singers from Sri Chinmoy: The Peace Meditation at the United Nations gave the opening performance at a special event called ‘United for a Culture of Peace through Interfaith Harmony’ which took place at the UN in New York. Guest speakers included the President of the General Assembly H.E. Mr. Vuk Jeremić, Deputy Secretary-General H.E. Amb. Jan Eliasson, and a host of UN diplomats, ambassadors, and interfaith leaders. In 1970, then Secretary-General U Thant invited Sri Chinmoy to conduct twice-weekly non-denominational peace meditations for delegates and staff at the United Nations. The singers included current and past UN workers, and have been performing Sri Chinmoy’s songs for many years at the United Nations and around the world. The event also included videos of World Interfaith Harmony week celebrations around the world, a symphony of peace prayers, and a World Peace Flag ceremony.